The daunting flood of promos that are sent my way each week makes the act of choosing something to review less of a science than a scattershot process that usually takes the form of picking something either due to a familiarity with the band, a familiarity with the label, or if the promo has an interesting blurb if neither of the other criteria apply. The UK’s MRVTI fall into the latter category, having provided a long-winded accompanying statement with a level of hubris that is as brazen as it is kind of intriguing. Said statement follows verbatim. “Negative Atonal Dissonance is not an album. It is a statement, a philosophy, an experiment; a rejection and reaction to the current trends within the mainstream and underground alike. Extreme metal has painted itself into a corner. Production values that serve no other purpose other than to sound recognisable and palatable. Arrangements, rhythms and harmonies that are more concerned with being identifiable and 'viable' than with originality. In an infinite universe, music is endless; a spectrum of emotion, of atmosphere, a vibrational connection running through and joining all frequencies; a spiritual, meditative practice, a dream and a nightmare connecting the creation with the creative force...”. Pretty impressive, right? Well, it definitely would be impressive if Negative Atonal Dissonance wasn’t mostly a mess of utter nonsense. I do sympathise with sole member Damjan Stefanovic’s position, though, and have long lamented the seemingly endless torrent of average - not to even mention the bad - material that's pumped out each and every week from labels and independent bedroom projects alike. So in this respect our feelings align and I respect his motivations, but Negative Atonal Dissonance, while doing everything its name suggests, actually makes the opposite point to the one Stefanovic was articulating with his bold proclamation: it demonstrates that there's merit in identifiable arrangements, rhythms, and harmonies. Negative Atonal Dissonance is three tracks (two if you take parts one and two of “As Consciousness is Harnessed to Flesh” as a whole) and 41-minutes of sometimes black metal but more often loosely structured noise which, as the description would suggest, is far from an easy listen. In and of itself this isn’t a problem in the slightest, but I also think there’s an unwritten understanding - an implied contract - that there will also be some kind of reward or payoff at the end of this kind of exercise and Negative Atonal Dissonance offers neither of these things, rendering the effort of digesting it largely redundant. The second track, “As Consciousness is Harnessed to Flesh Pt. 2”, is the most traditional of the songs on the album (or as traditional as they get, anyway) and is, by extension, the track that made the most positive impression on me. It’s a frequently unpredictable song that’s enveloped in a cold harshness replete with filthy screams and blast beats galore. 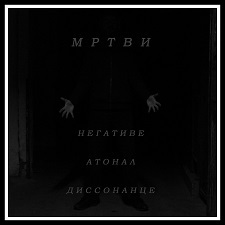 While obviously recognisable from a stylistic perspective, it also manages to conform nicely to Stefanovic’s stated manifesto through said unpredictability and offers a glimpse into the kind of black metal MRTVI are capable of creating when they aren’t trying way too hard to make music that reflects their stated aim. The other end of the spectrum comes from the closing track, “Negative Atonal Dissonance”, which is where my charge of utter nonsense comes to bear. This is a near 21-minute track that, while definitely negative, atonal, and dissonant, also literally sounds like Stefanovic simply decided to have a jam session with all of his instruments at the same time without much care toward what the end result would be unless it conformed to being negative, atonal, and dissonant. I’ve little doubt that this was the point, and in that respect he succeeded, but what might have been a jarring and uncomfortable listen had it run for a few minutes, say, at 21-minutes it’s an expression of tone deaf self indulgence that does little to convince me of the merits of his stated goal. At best it’s tolerable at this length but at worst it’s nigh on unlistenable and is something that I intend to never hear again once this review is done. As I said at the top of this review, I wholly sympathise with Stefanovic’s weariness with the current state of extreme metal and I also respect the fact that he has planted a flag and made an opposing case. I just wish that the case he made were as strong as he seems to think it is, because from my perspective, it’s not a particularly convincing one.